Ekiti State Governor, Dr Kayode Fayemi has distributed cheques worth N194.3 Million to 37 communities in the State for the completion of selected uncompleted community self-help projects. Distributing the cheques in Ado Ekiti on Monday, Governor Fayemi stated that the 37 world bank-assisted projects were initiated during his first tenure but were “regrettably abandoned” by the Fayose-led administration; adding that his administration, being a responsive government, cannot allow abandoned projects litter the State. The governor said he had recalled contractors handling abandoned 5km roads across the State in order to ensure that the roads are completed for the use of the people. 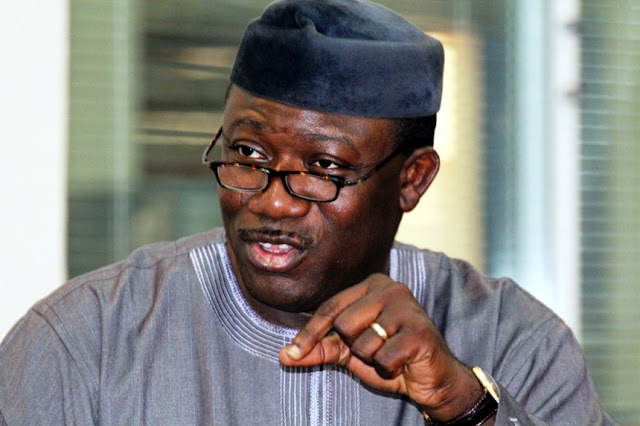 Fayemi said though 82 projects were presented, only 37 fell within the World Bank sponsorship guidelines; adding that the remaining projects would receive the attention of the state government. “I am happy to inform you that attention is being placed on the new requests you have submitted during my last meeting with Town Unions/ Community Development Associations’ chairmen and secretaries. As part of the resolution arrived at the meeting, very soon, the programme would accommodate more communities. We promise to make life more meaningful for our people and we are poised to fulfill our own part of the accord”, he said. Governor Fayemi solicited the continued support for the “overall success “ of his administration and “that of President Muhammadu Buhari”. In his speech, the General Manager of the State Community and Social Development Agency (EKCSDA), Mr. Steve Bamisaye, commended Governor Fayemi for facilitating the World Bank’s support for the project; saying that the governor’s “robust relationship with donor agencies” will bring about rapid grassroots development. Bamisaye said the projects will boost the economy of the benefitting communities because the Community Project Management Committees have been mandated to engage local bricklayers and carpenters to give room for local content in the implementation of the projects. Responding on behalf of the 37 benefiting communities, the Onisan of Isan, Oba Gabriel Adejuwon, appreciated the Governor for the gesture and promised that the communities would make judicious use of the fund. The monarch urged the government to continue to seek more inter-governmental assistance on behalf of the communities in its quest to develop the state.